Though the Joyful Embellishments group on Facebook has moved beyond feather stitching now, I've decided to continue with it on this piece. There are still 16 more seams to fill with my favorite feather stitches! 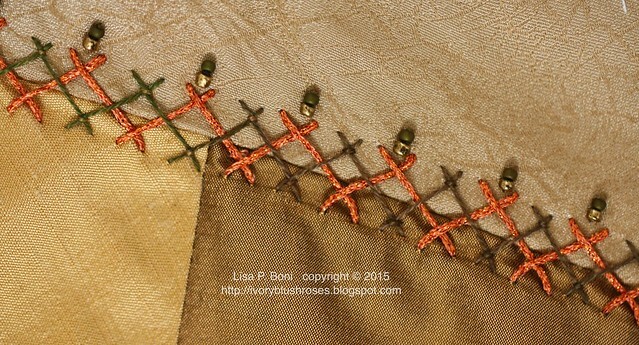 For these last seams, I'm using stitches from my stitch idea book that I've been keeping now for several years. This is one that I love and have used a couple of other times. 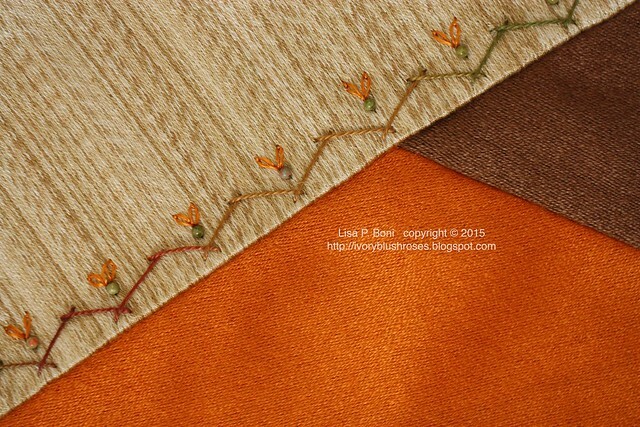 It's a triple feather with lazy daisies, straight stitch and beads. Sometimes, the simplest of seams can be the most elegant! 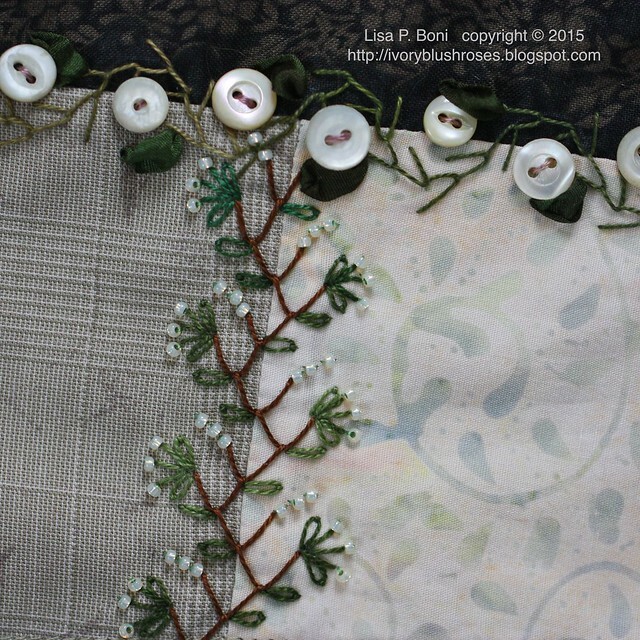 I love this straight feather stitch with lazy daisies and beads. 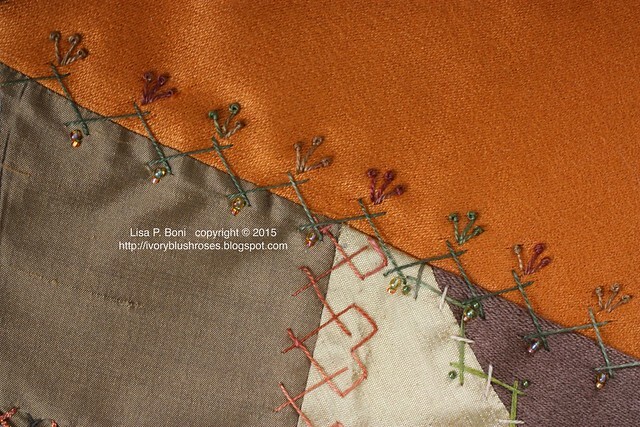 For February, the Joyful Embellishments group has moved on to Herringbone Stitch, another of my favorites. 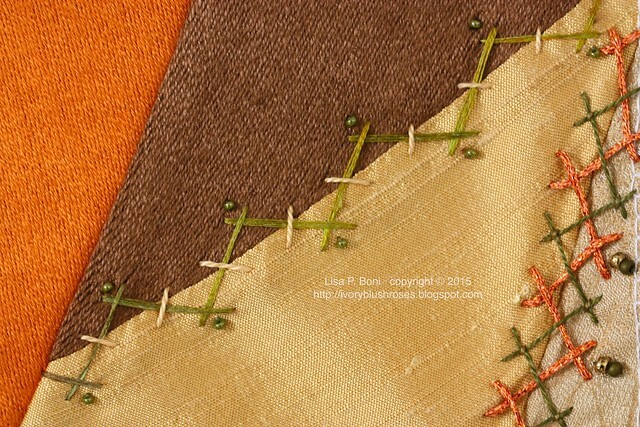 At the CQI retreat last year, I won a kit of autumn themed threads and fabric that included this already pieced block. It's large enough to make a table centerpiece mat and the kit included enough silk squares to finish the outer edge in prairie points! Once I opened it up, I wasn't sure quite how to approach embellishing it, as the patches are quite large for the most part. Then I realized it has 19 seams ~ almost perfect for a month of Joyful Embellishment seams! In the centers of the largest pieces, I'll add some autumn themed motifs eventually. Herringbone Stitch #1 was a simple herringbone with beads and lazy daisies. Herringbone Stitch #2 was a simple herringbone with the addition of some straight stitches and beads. Herringbone Stitch #3 was a double herringbone in different threads and the addition of beads. I used a medium Kreinik metallic braid for the fancy thread and a Valdani pearl cotton #12 for the other. Since I did the pearl cotton over the top of the heavy braid, I needed to couch it where it crossed to make it lay nicely. 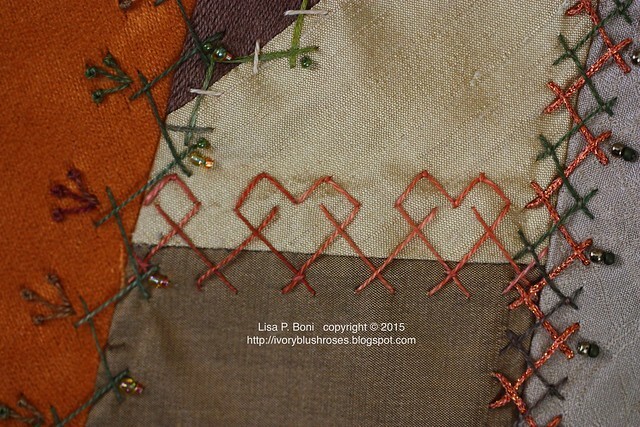 Herringbone #4 turns into heart shapes with the addition of some fly stitches! I think I need to add some beads to this seam in order to complete it. It looks a bit unfinished to me. Herringbone Stitch #5 adds beads and pistil stitch. I've used many variations of this over the years I've been crazy quilting! 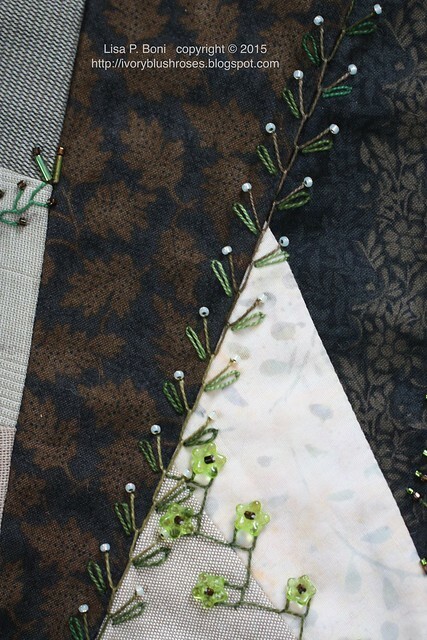 This coming week, I can get back to my CQJP and round robin blocks as the projects I've been working on (a couple of things for the Summer edition of Crazy Quilt Quarterly Magazine) are finally complete! I'm loving how everyones' stitching "voice" is coming through in this stitch along...Yours is lovely! Thank you for showing your exquisite stitching. Who would have thought that there could be so many variations to a stitch. I love all of your seams, they are so inspiring. Love the hearts especially.